Cover: An Invisible Way: A Synchronous Journey, 2013. Image: Les Alignements de Kermario; Carnac, France. THE SEARCH FOR MEANING permeates human existence. The mysterious enfolds us, and in brief moments, we awaken to its revealing. Guided by the energy of the psyche, these are excursions into oblique territory, the consequence of which is the ensuing responsibility of interpretation. This book presents a succession of encounters dislodged from ordinary time and consciousness that resonated with the experience of mystery and the search for knowledge. It is an unfolding, an unraveling of suppositions. Time, space, and rational thoughts are obfuscated; new patterns of fluidity emerge. In a state of receptivity a path unfolds. A circular journey forgoes beginning or end to find another path: infinity. MY LIFE IS PUNCTUATED by moments of sublimity that stand against a hushed blur of waking consciousness. These encounters with the numinous seem to access a realm outside time to form a synchronous corollary—a proposition of simultaneity among experiences of mystery. Their presence reveals itself concurrently as new and ancient. They exist as a substrate at the threshold of ordinary perception, a liminal space between experience and description that loosely tethers consciousness. It is an invisible way that surrounds our movements and shapes our path, revealing itself in moments when we make ourselves available to the waking dream. The unseen reaches out in a unitive language of reciprocal moments, when the knower and the known become one. We are permeable beings; sensing presence, knowledge is received. Once, on a road-trip across country, I visited Petroglyph National Monument in New Mexico. It was late summer, when the heat builds into afternoon thunderheads. The expanse of desert horizon confused orientation and distance. I found myself a mile or more into the canyon, compelled by ancient rock drawings of mazes, suns and figures that danced against the black rock walls. The wind picked up, the sky darkened and distant lightning crackled. I feared I would be caught in a thunderstorm without cover. I began to panic. How fast was the storm approaching? How had I not noticed? In an instant, a sense of calm overcame me. The wind spoke to me. It was not the same sensation as hearing with my ears or feeling with my skin. It was another type of transmission…communion. I sensed, and moreover knew, the wind as presence. An ancient reverberation resonated throughout my being. Some kind of elemental knowledge scintillated. It was a moment of awareness that revealed the scale of creation, a timeline beyond the confines of my finite physical body, a realm of transcendent morphology. It was a space outside time, one that breathes this life into being. The wind, a breath, shapes the landscape. This encounter also imparted understanding of the ancient rock art as a record—an antecedent of the visible. I understood that the human desire to communicate experience was innate and echoed in the netherworld of our ancestors. Others were here before me, their knowledge traced in stone. The drawings reached out from an arcane time, from a way of being embedded in another world of existence. It was haunting, foreign yet familiar at the same time. Although I had never before visited rock drawings, I felt I knew them. It was a surprising encounter, akin to a drawing made in childhood and recognized in adulthood, not through a conscious recollection, but through identification with the recorded conveyance of that which is made. The act of creativity resonated something primal. I began to view the events of my life in relation to the human impulse to leave a trace that speaks of existence, attuned to the cosmic energies that surround. My experiences in the Western United States were echoed in later journeys through France, where events of the past are interwoven with a long abiding relationship to the land. With each encounter of place, I felt increasingly aware of the shared path tread over millennia. I found meaning in the energy of form, guided by an invisible armature that underpins life's mysterious events. The solace of objects spoke to me: a twisted bit of iron work to hold a rope—a guide that gives form to an otherwise limp, fibrous material; a candle light vigil—a kind of inter-dimensional communication to the departed; a spiral staircase hewn in stone—a circular journey of ascension; stained glass windows casting tinted light onto the floor—a filter that illuminates a way; a rock aligned to celestial movements—a testament to the rhythm of the cosmos, a marker…all signs along a common path. On one level, there are visible historic remainders, such as styles in architecture or art, but moreover, I became sensitive to the invisible aura of object and place. Sites emanate their own presence—a palpable residue of both psychic and earth energy. It can be difficult to convey and uncanny to experience, the shared hush of wonder that overcomes seeker and skeptic alike. Revelatory moments are incongruous with linear time, and instead move directly into the meshwork that is all time, the eternal now. This is the continuous procession of life that traces back to ancient days—a succession of presence that suggests questions of origin and reaffirms the cyclical. The conquest of Christianity yielded the architectural wonder that is Notre Dame Cathedral in Paris. Yet this portal to the divine was built over ruins of a Roman temple to Jupiter. Prior to that, it was an ancient worship site of several lost temples. Earliest inhabitation of the site is dated to the Paleolithic era. Embedded in the plaza stones outside the cathedral, a circular plaque marks Zero Point, the center of routes in France, a place of convergence. This site, where an east-west river intersects a north-south path, has germinated wonder for close to ten thousand years. I contemplated what grain of phenomena underlay its continuous lure and was directed back to the land. Natural features, a hillside above a sweeping valley or a point where waterways merge, mark energetic boundaries and fields, the currents of which permeate the land and our perception of it. Ancient artworks visualize this deep abiding relationship with energetic movement through motifs of the serpent, the spiral or the circular course of the labyrinth. They symbolize infinity-that without beginning or end. These intricate designs inscribe both a physical path and a spiritual cosmology. In this way, the cathedral and the megalith alike serve a dual purpose to inhabit the material realm and to direct attention to the invisible forces that permeate it. Sacred sites tap into energy flows that transmute forms. Conduits of the eternal byways, they are the sustained reverberation that is the unfoldment of the universe. Echoes of ancient upheavals, seismic forces and collisions are in the land, rendered visual in the undulating movement of the hills and valleys. The land holds a mystery in plain sight: where are we going, where have we been? Carnac, situated in the Brittany (Bretagne) region of Western France is home to the largest concentration of Neolithic megaliths in Europe. Inhabitants of this era date as far back as 10,000 B.C. and most sites in the region were erected around 4000 B.C. These giant stone structures include several deliberately placed formations: menhir (a large standing stone in vertical aspect), alignments (rows of menhirs that converge toward a common aspect), dolmen (a “stone table” grave consisting of several upright stones topped by one or more perpendicular stones), cromlech (a circular or oval enclosure), tumulus (a stone passage grave with a narrow entrance, covered entirely by an earthen mound), and cairn (similar to a tumulus, but covered with small stacked stones). Megaliths in various states of preservation and decay are embedded throughout the terrain. While surveying Carnac, it became difficult to differentiate what was wrought by natural process and what was human placed. What at first appeared to be rolling hillsides were revealed to be decisively crafted human burial mounds. If we can begin to fathom the immense age of the megaliths at more than six thousand years old, it is possible to imagine the great endeavor that erected them, and how they are eroded and shaped by the elements since that time. They are closer to the geologic than to the hands of those who moved them. The Alignments of Ménec, Kermario, Kerlescan and Petit-Ménec span nearly three miles. The menhirs increase in height from eastern to western ends and number near three thousand. Their orientation corresponds to the setting sun of the winter solstice and indicates a culture sensitive to celestial movements and seasonal cycles. Yet, intentions of their placements remain obscure. The entire terrain is charged with an unseen presence, the invisible forces that shape our world. Sea levels have risen to create an island of Gavrinis, isolating and preserving it as one of the most richly engraved cairns. Across it, in the Gulf of Morbihan, lays the island of Er-Lannic, where elliptical remains of two standing stone rings (double cromlech) linger, half-submerged in the ocean bay. This landscape is ruinous and alive with evolution. 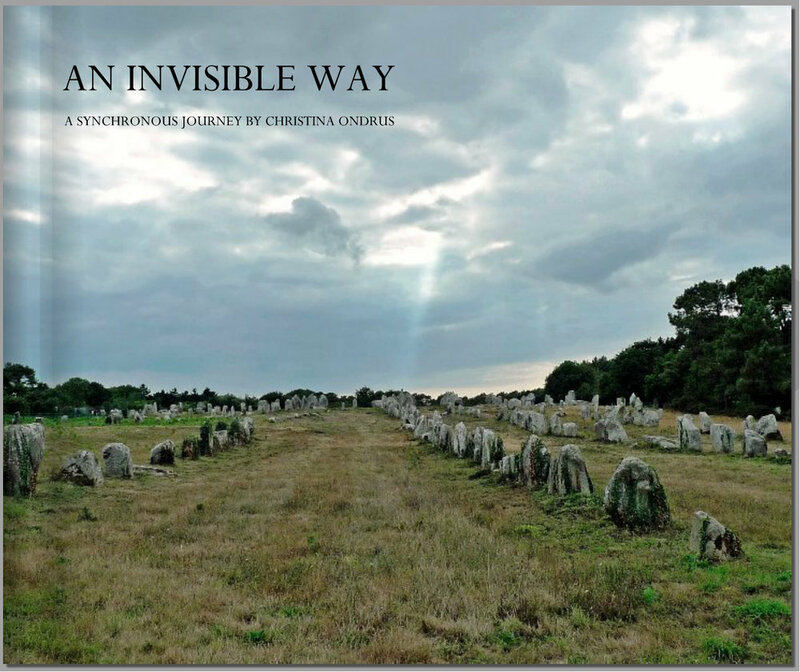 Few dwelling remains have been recovered near Carnac megaliths. It is thought inhabitants may have lived near the sea, areas now more than thirty feet below current ocean levels. What remains are the decisive high marks of an otherwise forgotten culture. The past is glimpsed through a portal through which we ourselves can pass only through imagining a time beyond time… a way beyond being as we know it. If we are receptive to experiences of mystery, we may slip between worlds and encounter the liminal space of awareness.